A wise man has said (I think it was Albert Einstein): We cannot solve the problems with the same toughts that created them. FAREWELL: Nils Arne Eggen speaks of why Ola By Rise had to leave Rosenborg. 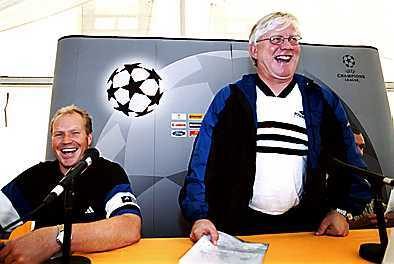 EXCLUSIVE: Nils Arne Eggen writes about the future of Rosenborg. This means, amongst other things, that even great and strong achievements always must be fed with new energy and new life to avoid being swallowed by the Law of Success Saturation. A law coupled to social feelings that tells us that even prestations are viewed as inferior, seen both from within and from the outside, unless the process itself and by that, the prestation, is given new toughts and ideas that are made visible in the practical performance. In the times of the best results, it is easiest and most neccessary to see behind the results, to cultivate good and old criterias for prestations, and not least, combine them with new ones. It is in light of this acknowledgement we must view the autumn's happenings in Rosenborg, which can seem somewhat strange from the outside when regarding the traditional Rosenborg way of doing things. The evaluation did however show that behind the very good results, with a new Norwegian premiership title and a new season in the Champions League, was a potential of improvement that just had to be released to achieve further growth. We had to recultivate the collective offensive quality, an offensive collaborative pattern that has been the team's trademark since the start of the modern and professional Rosenborg in 1988. This was Ola's responsibility as head coach and responsible for the profesional football. Moreover, some social relations went missing between the coach and the players, between the players, between the head coach with his assistants and the club leaders represented by Rune B. (director of sports) and Nils S. (Chief Executive), representing the board. Relations that in plain text means an open, honest and almost confidential communication between all parts of the team, both on and off the field, which is the most important premise when the total collaborative pattern of Rosenborg, with its distinctive character, shall function well. Everybody must take this responsibility! But it was in this process that Ola's role as head coach in an almost inexplainable way failed to be reversible this time. Even tough he acted extremely Rosenborg-like and cleaned the air by blowing "Clear ship" with his question of confidence on his future as head coach, this special Thursday before the league final. In this he laid the premises for the league title! We of Rosenborg has all learned from this process, included Ola. Ola is and will always be a Rosenborgian. I will be surprised if Ola, competent and attached to Rosenborg as he is, shouldn't play an important role in the future of Rosenborg, when the feelings that are tied to the process is relearned and purified according to the values that always will set their marks on the Philosophy of Rosenborg. One of the main forces in Rosenborg is the belief on own qualities in all parts of the organisation. As a result, we do not listen to any self-proclaimed "football experts". And further, the new team of coaches had to be Per Joar as main responsible and Rune S. as an assistant, with support from the knowledge of the old couple Bj�rn H. and Nils A., in strong cooperation with Rune B. and Nils S. and the other important supporting characters for the main product: a good football team! We should be good to make eachother even better in Rosenborg! This is vital, because the other teams in an even stronger way, already next season, will challenge us in the fight for the Championship and the Champions League. And that is good, because then we keep the focus on evolving our own performances. We also know that it is always harder to ever recreate a performance than to create it the first time, and that we will have to recreate them ourselves. We might not be able to do it, but at least we will have tried.